Round 3 of the 2016 Downhill MTB World Cup was in the uncharacteristically sunny Fort William, Scotland – an emotional day, the first World Cup since legend Steve Smith died, but riders racing their hearts out in his memory. If you missed any of it, here’s my collection of media I’ve found, focusing on the women’s racing – and as always, if there’s anything I’ve missed, please do tell me in the comments, or on twitter, and I’ll add it in. I love Belgian races and their multiple names! This is Round 6 of the Lotto Cycling Cup, a series of tough races around the country, and even they call it about 3 different names! It’s a looping course, pretty much flat, two 29k laps, 6 6.9km laps and then one of 4km, and it’ll include riders like Marianne Vos and Jolien D’hoore, and I’m really excited about the Lotto Cup’s steaming! This will be on RTV.be here, from 15:00 CEST/ 2pm BST/ 11am AEST/ 9am EDT – and you can also follow via the Lotto Cycling Cup twitter and the #KVLLC hashtag. Draft startlist on Cycling Fever. This is going to be the most amazing race. Downhill is always full of adrenaline, in breath-taking surroundings, with fantastic fans – and for us at home, there’s always tons of media. Sunday 7th June is going to be fantastic for women’s cycling fans, with two explosive, beautiful races, at the highest level of road and downhill MTB – the Fort William DH World Cup in Scotland, and in the USA, round 6 of the 2015 women’s road World Cup, the Philadelphia Classic, and best of all? They’re LIVE! The elite finals are on Sunday 7th, and the wonderful Red Bull Bike are streaming the women’s and men’s races here on Red Bull TV, from 2.30pm UK BST (15:30 Euro CEST, 9:30am N American EDT; 11:3opm Australian AEST). If you’re new to MTB, it’s the perfect introduction, Rob Warner‘s commentary combines an encyclopaedic (& first hand!) knowledge with infectious enthusiasm for the sport, it’s very easy to pick up and in the most fantastic scenery. If you miss it live, you can watch the archive there too, and there are lots of ways to follow the action of the practice and qualifications too. Tahnée Seagrave is the latest young British downhill MTB talent, the 2013 Junior DH World Champion who finished her first elite season on the World Champs podium, winning bronze last year in Hafjell. She’s got huge dreams for the 2015 season, but she’s also got big plans off the bike for the first DH World Cup at Fort William (6th & 7th June). Tahnée is an ambassador for UK breast cancer awareness charity Coppafeel, and Fort William will be the location for her competition, #Copparide, where lucky winners will get a limited edition race bike, the kit she’s races Fort Bill in, and a huge pile of MTB goodies. So how do you enter? There 5,000 #Copparide wristbands, costing £5 each and every purchase gets an entry into the prize draw, with prizes able to be shipped anywhere in the world. Buy and enter here! 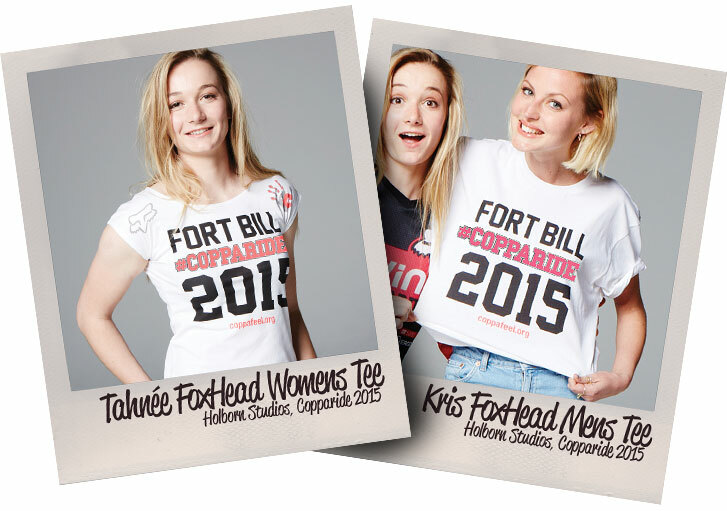 And if you want to support them in different ways, the #Copparide t-shirts will be on sale soon, with all proceeds going to Coppafeel – keep an eye on the FMD Racing online shop, and at the World Cup. If you’re there in person, hashtag your photos #Copparide, and you could win a camera. All the details of the competition, the charity and more are here on FMD Racing’s #Copparide webpage.